The oil complex is trading lower across the board this morning. Crude reached a high of $69.56 during the early trading hours yesterday, but could not hold on to that strength and fell gradually throughout the day before ending the day lower at $68.29. Crude is continuing the downward trend this morning, trading down 35 cents at $67.94. 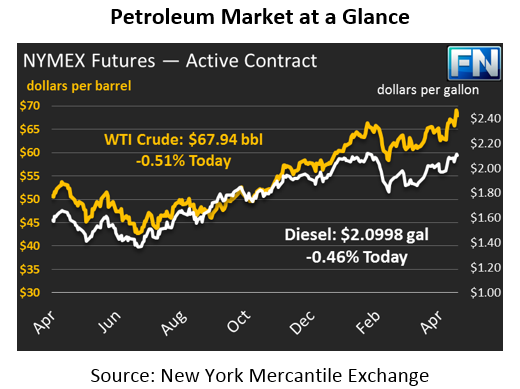 Although still possible, it doesn’t look like this will be the week crude breaks through $70/bbl. Fuel prices are tracking crude lower this morning. Both products managed to make small gains during yesterday’s session, despite the decline in crude prices. Today, diesel is trading at $2.0998, down 96 points from Thursday’s close. Gasoline prices lost 74 points this morning to trade at $2.0700. Market moving news is lacking this morning. A fire was reported yesterday at Valero’s Texas City refinery. OPIS reported that an explosion occurred in the alkylation unit. The fire was quickly contained and no injuries or fatalities have been reported. The refinery fire did not seem to impact product prices on Thursday. On the global front, OPEC and non-OPEC members will be meeting today in Saudi Arabia to discuss production cuts for the remainder of 2018. Bullish sentiment arose earlier this week after news came out that Saudi Arabia intended to “beef up” the valuation of state-owned Aramco ahead of the IPO by pushing the per-barrel price range to the $80-100 range. However, the Oil Minister told reporters that $65-75/bbl is a more realistic range for 2018. This morning Trump tweeted he would not accept high oil prices resulting from OPEC’s production cuts. Following his tweet, oil prices slumped from their three-year highs. Of course, the only legal recourse the U.S. can take to lower oil prices is releasing crude oil from the Strategic Petroleum Reserves, which Trump has already done to help fund his budget (meaning, the release is already priced into current oil prices). In addition, markets generally expect that Trump will reimpose sanctions on Iran following May 12, which would cause prices to rise even higher. So while Trump may be playing OPEC’s game of starting rumors to impact markets, any action to back up his statement seems unlikely.